In making the decision to come to the UAE we took a look at the cost of living as compared to Canada. For the most part the UAE looks less expensive to live. The things that appear to be more expensive: alcohol, sports club memberships and rent don’t really apply to us. We don’t drink and the university provides housing and sports facilities. So I was hopeful that the cost of living would be significantly less than what we are used to. While we’ve only been here about 3 weeks and I am still cautious about costs things do appear less expensive here. The other day Lisa asked that I stop by the corner store on the way home for lunch. Yes, I am close enough that I can walk home for lunch. At the store I bought a loaf of whole wheat bread, a pack of 6 pitas, a couple bell peppers and a bottle of Coke. The cost was 9.5 dirhams. A dirham is worth approximately .27 Canadian dollars. This means I spent about 2.57$ for everything. In Canada just the Coke would cost nearly that… especially purchased at the corner store. While we don’t yet have a car I’ve learned that the cost of gas is fixed. We are used to keeping a look out for the best deal at the pump. Here every station charges the same. Special is the low grade gas. The only kind vehicles I drive ever get. What do they charge? Approximately 46 cents (CAD) a litre. 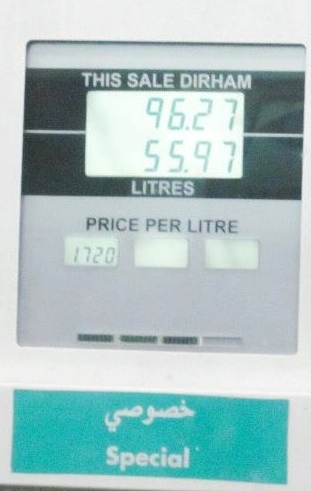 When we left Canada I believe the cost was about 1.36$ a litre! I have no idea what the cost of insurance is but I can tell you I fear for my life every time we get in a car. I think the lines on the road are just suggestions here. Maybe I’ll fit in well… I get my driver’s license on Monday. I’m not used to the prices yet. When I look at a price tag and see 100 on it I have an instant repulsive reaction. However, 100 dirham is the equivalent of about 27$. It’s not a natural calculation. So when you see that a Subway sandwich costs 23 dirham you immediately think perhaps only a 6 inch sandwich will do. Of course, 23 dirham is about 6.21$. Fast food is cheap and plentiful. Everyone delivers (probably a consequence of cheap petrol prices)! It didn’t take long to find the student created website on campus, ihungry.ae, which features menus from local restaurants that deliver to campus. At the time of writing this there is something wrong with the site – only 3 menus are available. Usually there are over 30. Let’s hope they fix it soon – someone could starve to death. At dinner time each night there are dozens of delivery guys on motorcycles with food boxes perched on the back. A blurry picture of fast food delivery keeping campus residents fed, its an important job. We’ve only ordered in once but it was an interesting experience in efficiency. I rang the number for KFC and ordered their family meal (15pcs chicken, mashed potatoes and gravy, a couple salads and a 2 litre of Pepsi) for 74 dirham – thats 19.98$ for the mathematically challenged. Don’t worry I have a calculator. The KFC operator must have a database of callers because she called me by name – not my name but I suspect the name of the fellow that lived at K33 before. She promptly updated the info and took our order. In 40 minutes one of those motorcycles was pulling up in front of the door. In Canada you are lucky to get your KFC order in 40 minutes when in the store – KFC doesn’t deliver back home. Taxes. Where are all the taxes I’m used to. There is no income tax here and no sales tax. Imagine going to the counter in a store. The item in your hand has a price tag that reads 75. The teller rings it in and you hand her a 100 dirham note. Now focus for a moment my Canadian friends, I know this may be hard to believe, the teller gives you not only your product back but 25 dirham in return. In Canada 75 is really 84 you see or depending on what you might be purchasing or which province you are in 75 could actually be 78.75 or something else all together. The shape of all the bottles is strange – long and skinny. Canada we enjoy several sizes of single servings of Coke. I believe the sizes begin at about 591ml. At least, that is the standard or regular size. Here in the UAE the standard seems to be 500ml. The cost though is generally 2 dirhams or, you guessed it, about 54 cents Canadian. Okay – stand back – I’m going to attempt some math. At about a cost of 2.25$ for a bottle of Coke in Canada the price is .38 of a cent per millilitre. In the UAE at 2 dirham for 500 millilitres the cost would be about .11 cent per millilitre? There are lots of different birds here. Some have long legs like the Crab Plover. And some have funny tails like the Bridled Tern. Some are big like a Flamingo. We think the blue feather at the bottom of this page is from an Indian Roller. The picture of the bird with the crazy long beak is called the Eurasian Hoopoe. The picture below does’t show it but he has a crazy mow-hawk. There are great pictures of the mow-hawk at the link in this post. Some have lots of cool colours. Some are small like the Little Owl. Some have long beaks like the Pied Avocet. Some have huge wings like a Northern Lapwing. Some like to swim like the Whooper swan. There are lots more birds:) They’re all pretty awesome. We haven’t seen all of these but we have seen a ton. It is really hard to take pictures of birds. The University is a great place for bird watching. On another note, I started to do this tv show called Cooking with Socks (Socks is a sock monkey). I interviewed him and the video is at the bottom of the page. I’ve done 7 episodes so far. I’m planing on posting one every blog post I do! He’s always doing something wrong but fixes it in the end. Hi friends and family. Oh and hi aunty Robyn. I want to tell you that they call soccer football in the UAE. My dad signed me up to play football. There are 2 ginormous soccer fields where we live. The grass is made of rubber and the dirt is like black plastic seeds. There is giant lights so you can play at night. At my first soccer practice we did an obstacle course. It had these ladders so you had to jump like a frog. There were poles too that made you jump like a kangaroo. In the soccer game I fell down a couple times but I got straight back up. I had fun with a smiling face. This guy with shin pads fell down and said that his legs were broken. My dad says that is an advanced soccer move. Whenever the other team had the ball my teammates would stay behind but I would go and take it from them. I made a great pass to my teammate. I got a free kick ball because it went out of bounds. We almost scored at the last second but the game ended up being a tie. The referee was counting from 3 to 0 and when he reached 0 the game was over and it was a tie one to one. I scored the first goal! Then the other team scored. At least once a day I have a moment of… lucidity, realism, awareness… where I focus on the fact that I have moved my family to the other side of the planet. There is plenty of home transplanted here but this is still the Middle East and a culture quite foreign to me. The weekends are not even the same. Sunday is truly the first day of the week here. My work week begins with Sunday and ends on Thursday. Friday is the sabbath and Saturday is the last day of a two day weekend. The church here meets in a rented Villa. There are plenty of members (about 130-140). The majority of the church membership are from the Philippines. There are 3 LDS families living at AUS. It just so happens that our next door neighbour (we live in K33 and they live in K32) is the Stake President. On the Thursday night before our first Friday I took the kids to the pool at the faculty leisure centre. There was another family there and we got to talking. It wasn’t long before I discovered they were members too. Jeremy and Bridget Palmer and their two daughters (4 & 6) are from Idaho. What a blessing it was to run into them on the night before our first attempt to get to church. I hired a car to drive us to the church but of course the driver had poor command of English (and I no command of Arabic). Jeremy (who speaks fluent Arabic) rode along with us and directed the driver to the church. Clearly we are being watched over. My dad is convinced I carry around a bucket of lucky horseshoes. I know better. Let me tell you a little about AUS. They do nothing small in the United Arab Emirates. All of the buildings on campus have enormous footprints with high ceilings and sculpted exteriors. AUS is one of several universities/colleges within University City. As such, it is a gated community within a gated community. To get on campus one must pass through guarded gates into University City and after passing by other institutions through another set of guarded gates. There is security everywhere. So far they seem to just stand around in the blistering heat a whole lot – though I was nearly tackled when I attempted to bring my lunch into the library. It took me a couple minutes to convince the guard that I was a librarian and was taking it to my office. From his expression you could tell he had a hard time believing I was a librarian and not a student. We live about 500 meters from the library. I can make the walk to work in less than five minutes which means I can come home for lunch too. There is a free bus that makes scheduled stops all over campus. Though one could walk anywhere on campus the heat makes that nearly intolerable and probably dangerous. I have had heat stroke and never wish to get it again. The sports centre is free to faculty and staff. It boasts an Olympic size swimming pool. I hope to make good use of it. To do so one needs to figure out the hours. Men and women do not share the pool at the same time. The leisure centre for faculty and staff is also free and includes a small outdoor pool, weight room, TV room, and gym. I have the kids signed up for swimming lessons. Jaron and Lilli are signed up for Soccer and Kirsten is going to learn to Hula. All of these activities are free. Lisa and I are going to take a spinning (cycling) class together. Campus seems excellent for family life. There are playgrounds everywhere. We are told that within a month the temperature outside will be very tolerable. Apparently we are in for five months of fabulous weather. We hope the kids will make good use of all the facilities here and make some excellent friends. I took a few pictures of campus to post here. Lisa really needs to be the one to take photos – I’m terrible at it. I’m sure we’ll soon have thousands of great photos to share. For now here is a small handful. So we moved into our “fully furnished” townhouse and I instantly had an itch. Our walls and floors are bare and where are my photos? They’re in a box, in the attic on my parents property in Northern British Columbia. I need to go shopping and put something on these walls! The goal is to be frugal for the first few months to save up a shopping budget (it’s going to be a long couple of months). The 3 trips to the grocery store this week alone have relieved that itch to shop … for food anyhow. Speaking of food. If anyone wants to send us a care package, I can’t find coconut, skor bits, paprika, oatmeal or vanilla so far. Thanks Robyn for this, as I am also craving “Holy Crap” cereal that I can’t seem to find here. At this point, we’ve been relying on members of the church (for whom we are very greatful) and the AUS bus that goes twice a week to the Sharjah Co-op in Halwan to get us around. In the grocery stores most things look familiar, or like items we’re familiar with. Prices are fairly comparable. 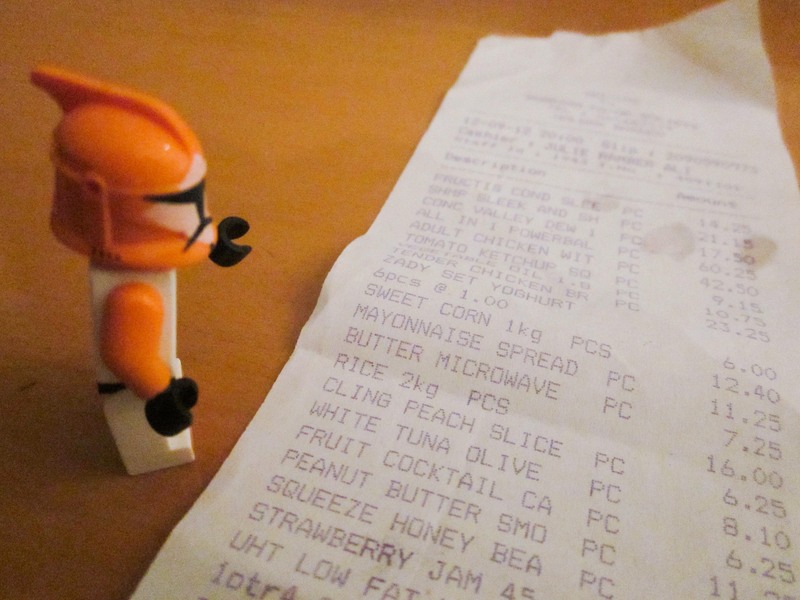 Bounty Hunter Bob helping me look over the grocery receipt. One very obvious difference from the norm that we are used to in Canada is the weighing of produce. In Canada, a scale is provided and we weigh our produce items to give us an idea of how much we are spending. In Sharjah, there is a manned counter you take your bagged produce to and they weigh, and label it with your amount of goods. At busy times, this area can be likened to a cross between a mosh pit and a food fight as bagged produce is flung at the counter so you can be on your way. Throw in a little mystery as you may not always get back what you flung at the counter. Today our neighbour friend (the Stake President’s wife) took us for a tour of the Sharjah Corniche. We went into a Roastery (which Kirsten is excited to talk about) and a Kitchen Hardware store. In the Kitchen Hardware store items are piled floor to ceiling (and they have high ceilings) with narrow pathways to move through the store. From the moment you enter the store there is a man there watching over you. I quickly learned he is there to bargain with you for the price of items. Somethings have prices, but nothing is fixed. I have a hard time with haggling. It’s either a fair price that I’m willing to pay or it’s not. Who am I to tell the man he’s asking too much for his stuff? We saw some beautiful architecture I would love to have a closer look at, and some fantastic looking fabric stores. That we’ll save for another day. It is really hot here in the UAE! The heat never quits. It feels like you can cook chicken outside. So I like to go swimming all the time. There is a pool just down the road from us. It has a slide that is really fun. The slide is really steep and has water going down it so it is really fast. My dad has to catch me at the bottom of the slide because I can’t quite swim yet. I can swim a little bit but I’m not quite strong enough yet. We also have fun adventures here. We went to the salty ocean the other day. It was really fun but the salty water stung my throat and mouth and eyes and nose. I didn’t like that very much. My dad buried me in the sand. I did like that. There is a climbing wall here and I am going to learn to climb it. Dad signed me up for swimming lessons and for soccer – it is going to be really fun. The only thing that could make this place better is if all my friends were here too. Our new house is totally awesome. We have 5 bathrooms! My dad hates the staircase because it is super long! Luckily, I have my own bedroom:). Right after I took the video below the shipping company came with the rest of our stuff. Now my room has way more stuff in it. It’s really fun when you have not seen something for a long time and when you start to unpack you get to see it again. There are these weird hose things in each bathroom but I don’t want to say what they are. The couches are not very soft but we have 3 of them. Jaron got the maid’s room. I think that makes him our new maid. There is no grass in the backyard 😦 but dad says they are going to plant some for us. We’ve already made some friends here. Today we went to the beach. It was really hot outside. The water was very salty and tasted bad. The salt got in my eyes and up my nose. It was really painful. 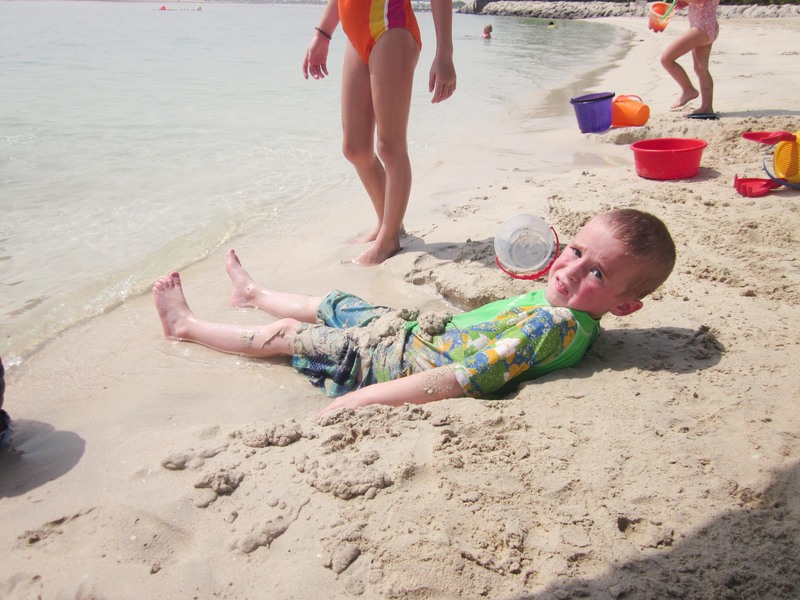 The water was as warm as the air but we still had fun playing in the sand and swimming in the water. My friends’ dad caught a sea urchin and showed it to us. It was black and really poky. After the beach we went to our friends house and jumped in their pool. The pool water was nicer than the ocean. We are having lots of fun in our new place. Tomorrow I start school. School will be awesome because mom is our teacher. If you read my dad’s post, you will remember that we left Canada on a grand adventure! It’s really neat here. When my parents, siblings and I arrived we thought it was unbelievably hot! Turns out it was just the hottest day of the summer, so now it’s not as hot as I thought it would be. It’s still quite hard to breath but not as bad as it was when we got here. I’ve been researching the currency in the UAE. There are dirham and fils. A dirham is like a dollar only it’s worth 27 cents in Canada. A fil is like a cent in Canada; 100 fils equals 1 dirham. There are three coins in the UAE: a 25 fils piece, a 50 fils piece and a one dirham piece. There were three other coins (1 fil, 5 fils and 10 fils) but they stopped making those, just like they recently did with the penny in Canada. I think it was the night we got here, Jaron was in our backyard looking around and he saw a circular lid covering a whole in the patio. 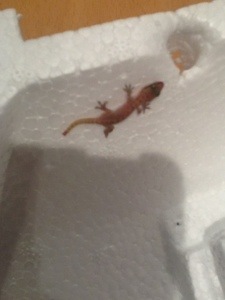 Jaron’s a curious little boy so he lifted the lid up and a lizard jumped out and ran up the wall of our backyard. Jaron came screaming back into the house telling us about what he saw. It was pretty funny. The next night I was babysitting Lilli and Jaron while mom dad were out shopping for food. I was moving my desk around when I noticed something squirming in the corner of my room. At first I thought it was a spider but then I noticed its long tail sticking out of the shadow of my desk. He was super cute….. I made a little house for him out of plastic and styrofoam. He ran in there a bit but then mom and dad came home so we had to put him outside. Before we let him go Lilli named him but I can’t remember what the name was. I’m having a great time. It’s a lot of fun here. I just hope it cools down a little bit. This is really going to take some getting used to. A few short months ago I was offered a job with the American University of Sharjah. AUS is located in the United Arab Emirates. Sharjah is the northern most of the emirates in the UAE. 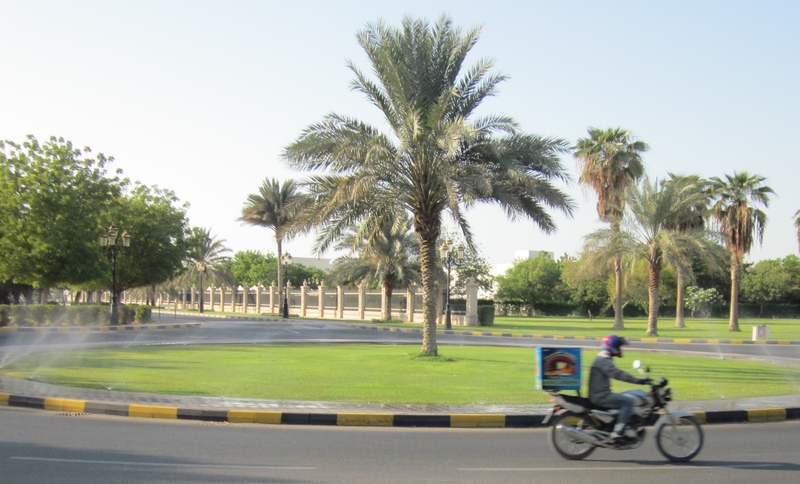 The campus itself is approximately a 20-minute drive north of Dubai. We accepted the offer and are now on a grand family adventure with an indeterminate end date. Not having a fixed end is, in my opinion, one of the defining characteristics of an adventure. As I write, the clock on my computer reads 3:32pm. That time is, of course, British Columbia’s time. We are somewhere over Turkey by now or possibly Syria. This plane will land in Doha in the country of Qatar on the Arabian Peninsula. The local time must be somewhere between 1 and 2 am. I slept little on the 12-hour flight from Vancouver to Frankfurt. I envy Jaron. At 35lbs and about 3 feet he curls up comfortably even in these economy class seats. By the way, travelling with dogs is not as bad as it seems unless you are flying into the UAE. It turns out that pets can only be brought into the country via manifested cargo. In other words, they must be shipped as airfreight rather than checked as luggage. This obscure law really messed up the airline. By the time they figured out they couldn’t take our dogs it was the morning of the day we boarded the plane to Frankfurt. When I booked the flight with Qatar airlines I also booked the dogs. I was told to call the next day to confirm the dogs. So I called the next day (2 or 3 times) and then the next and the next. Each time I was told to try later. They assured me it was just a formality and all would be fine. Then the fated email on the morning of our day of departure that the airline could not take the dogs. I spent hours on the phone trying to figure out why. The baggage check would tell me I could not take the dogs and send me to the cargo department. The cargo department would tell me I could take the dogs and refer me back to the baggage department. So, when we arrived in Frankfurt at the Qatar baggage check I was worried. We went through the story with the supervisor at the counter and she got in touch with a pet shipping company. It looked as though I would have to send my family on to Dubai without me while I slept in the Frankfurt airport until a shipper could claim the dogs and I could catch a later flight. Lisa and I divided passports and luggage and paperwork and prepared to go our separate ways. When in the midst of changing my flights the pet shipping company representative suddenly appeared. He measured and weighed the kennels and quoted me the price… 936 Euros! What could I do? I raced to a moneychanger and asked if I could get the money from my visa. They sent me on to another moneychanger who in turn directed me to an ATM. In went my visa card and back came an error message… once, twice, three times and the money was not forth coming. A final try with my back up credit card and again an error message. I felt sick. I can recall a handful of times when I have pleaded for urgent assistance from above. Standing helplessly at an ATM I said a silent prayer and put that credit card back in the machine. It worked… but I could only get 600 Euros. I raced back to my family and the shipper and explained that I could not get all the money but if he would take the 600 I would happily send the rest when I arrived at my destination. He graciously offered to take the dogs on my word that I would pay the bill when it came. He would not even take the 600 Euros I had in my pocket. While this was all happening another issue arose. I foolishly did not print the entry visas for the UAE. I was told that I would be met at the Dubai airport with the original visas and thought that meant I did not need to print copies. My family was in tears standing rejected by the baggage staff when I returned from dealing with the shipper. To make matters worse I had archived my email, which contained the visas. Somewhere in my baggage was a USB thumb-drive containing all my archived email. I had no idea where it was. Then an impression came that the thumb-drive was in a particular pocket of my carry-on. I grabbed at my bag and thrust my hand into the pocket, wires, ear buds and yes a thumb-drive. There was panic as I imported the emails back into my computer ever so slowly; panic when I realized I had no Internet access to email them to the airline and panic when after the airline printed them directly from the USB drive Jaron’s visa was missing. His was sent in a separate file that I eventually found. Had I not believed that the shipper could not send my dogs in time and Lisa and I needed to separate she would not have attempted to check-in without me. This, of course, would have left the visa issue undiscovered until it was too late. As it was we barely made it through customs and security to the plane. While it was excruciatingly stressful everything appears to have conspired to open the way for us. Some say miracles have ceased. At this moment if I were to stand beside Moses as he parted the waters of the Red Sea I could feel no more awe or gratitude. I am happy to report that the dogs are safe and happy to be with us at our new home. We’ve been here an entire day though it feels like two. The adventures have not quit. Perhaps Lisa or the kids will relate some of them in the next post. My children have the assignment to enter a blog post every week while we live in the UAE. Lisa and I will also write weekly. These entries are largely for us but we are happy to share them with you too.